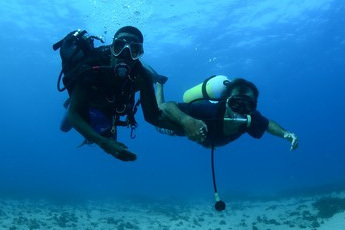 Sodwana Bay is said to be South Africa’s premier dive destination and one of the top ten dive sites in the world. We would say it is the best on this planet but we are biased! 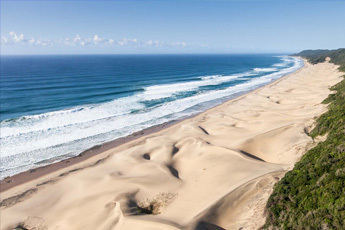 What makes Sodwana Bay special? Sodwana has undoubtedly the best coral reefs in South Africa, These reefs are of the most southerly coral reefs in the world and are fed by warm water sweeping South by the mighty Algulhas Current. The latest Living Planet Report produced by WWF International in collaboration with the Zoological Society of London, the Water Footprint Network and the Global Footprint Network makes sobering reading. The number of wild mammals, birds, reptiles, amphibians and fish on our planet has fallen by half over the last 40 years. This means that the state of the world’s biodiversity is worse than ever. Between 1999 & 2001, a number of expeditions were undertaken to the KZN coast by a delegation of Belgian and South African echinoderm and seaweed experts in a collaborative biodiversity study. One of the many aims of the trip was to make the first biodiversity assessment of the echinoderms in an area which is historically known to be under-sampled by biologists. It’s no easy feat to get 6 trimix divers from SA, England and the USA plus a film crew, enough kit and cylinders for 2 rebreathers and 4 open circuit divers, plus enough helium and oxygen to spend two weeks diving trimix off of the coast of Tanga in Tanzania. Our expeditions purpose in 2012 was to search for and film the Tanzanian Coelacanth population for SA’s film production company “Earth Touch” they were making a documentary for National Geographic to be called "Dinofish". This week, Triton lost its leader, creator and a vital, inspiring, powerful and generous man who deeply touched so many lives. Peter Timm was a partner, father, brother, friend, dive buddy, instructor, skipper, boss, mentor, teacher, electrician, builder, pilot, mechanic, plumber, photographer, honorary officer and citizen scientist. An exceptional man who did so many things for so many people. Capable, innovative and determined, Peter and his team created a place and a business that brought so much happiness, beautiful memories, great energy, direction and personal growth. After spending nine months attached to a coelacanth, anArgos Mini-PAT satellite tag was recovered by Triton staff offshore and 16 kilometres south of Jesser Point at the Sodwana Bay node of the iSimangaliso Wetland Park. 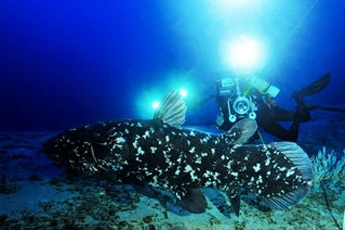 The coelacanth, the 26th of 32 individuals known from South Africa’s first World Heritage Site was tagged by Trimix Divers on the 13 May 2013 in Jesser Canyon, 12 km south of the site where the tag popped up at 1am on 8 February 2014. 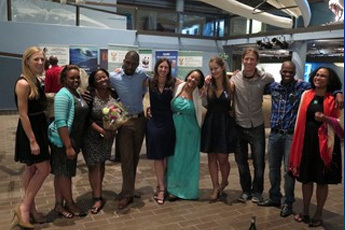 There are few places on this blue planet that can match the marine diversity found along the shores of Southern Africa. Two very different oceanic currents flank the coast of the southern tip of the African Continent. The west coast of Southern Africa is surrounded by the cold Benguela Current and on the east coast the warm Agulhas Currents moves south from the tropics. These two currents create not only two radically different marine environments but also shape the terrestrial ecosystems and the human settlements along the South African coast. Divers and snorkelers alike may have had the opportunity to view anemonefish, also affectionately known as clownfish, in their natural habitat; but how many fully understand the complex association between these fish and their anemone homes? 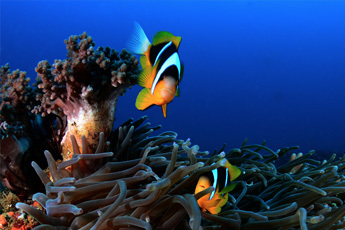 An astonishing symbiotic relationship exists between these two organisms, enabling the fish to enjoy a safe home, while the anemone is protected from predators and cleaned of parasites. 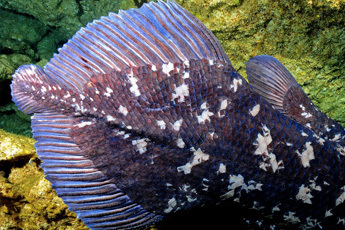 Trimix divers discovered Sodwana’s coelacanths in 2000 and twelve years later, these advanced deep divers continue to document new coelacanths and other exciting finds in the submarine canyons of the iSimanagaliso World Heritage Site. Last week, Triton Dive Charters, a diving concession holder with a special permit to dive below 60 m in the iSimangaliso Wetland Park, hosted a very experienced team of mixed gas divers, the Alternative Dive Group. 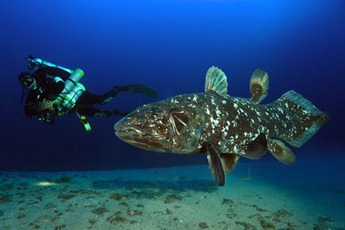 Five canyon dives were undertaken and coelacanths were found on 3 occasions.